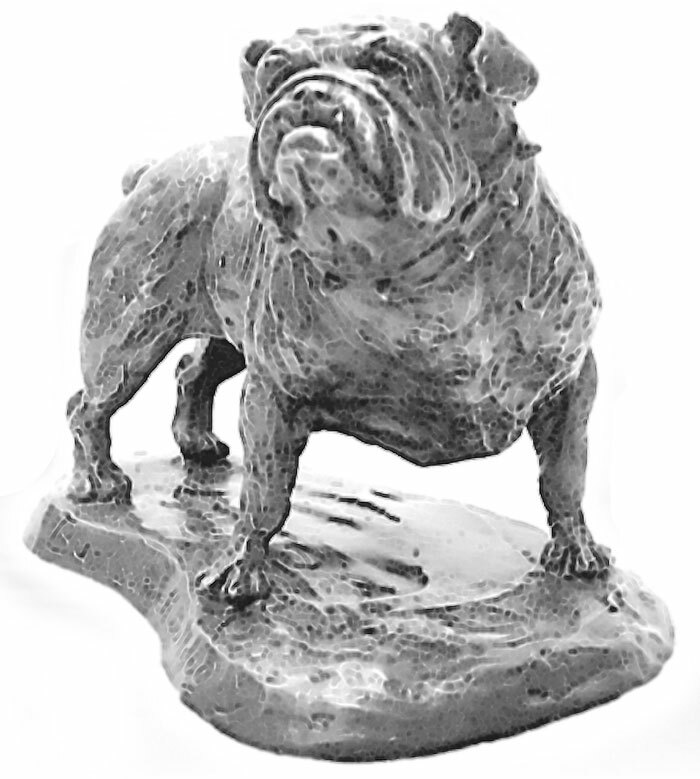 In the rough-and-tumble days of the 20th century, the animals were popular as guard dogs for businesses. With the Burkburnett oil boom in full swing, the dogs were everywhere - guarding from theft and sabotage, traveling with itinerant drillers and roughnecks. Later, with the town settled down some and the school system formed, a team mascot was needed. 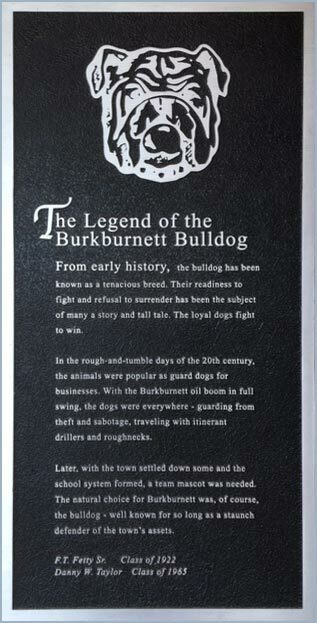 The natural choice for Burkburnett was, of course, the bulldog - well known for so long as a staunch defender of the towns assets. What better gift can you give other than by investing in our future? You can be a part of this by helping the Alumni Association reach our goal of raising $500,000 for THE BEST OF BURKBURNETT ENDOWED SCHOLARSHIP FUND. The growth of the fund will help BHS graduates fulfill their dreams of college. The Alumni Association presents a $5,000 scholarship each year to a graduating senior. The money donated by alumni is collected and deposited in an endowed scholarship fund with the Burkburnett Legacy Foundation, a fully qualified 501(c) (3) non-profit organization. Directed/Donor Advised Funds go to specific programs, projects, scholarships, departments, grade levels, campuses (secondary & elementary schools), teams or initiatives and are a way for you to direct funds to the area of your choice. 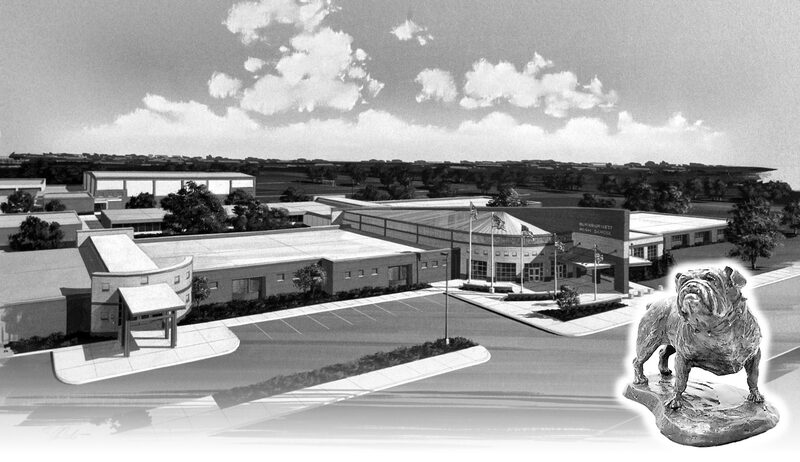 Two examples of DAF are the J.B. and Beverly Riley Fine Arts Grant Fund or the Bill Zimmerman Helping Hands for Hardin Elementary School Fund. Please Note: The minimum contribution for a new DAF gift is $1,000. All gifts are tax deductible and are held by the Burkburnett Legacy Foundation, a fully qualified 501(C) (3) non-profit organization under the Wichita Falls Area Community Foundation. The Annual Fund consists of contributions of an unrestricted nature given by alumni, parents, and friends. The need for unrestricted giving is critical as it allows the school and the Association to support important programs and to make available professional staff development not provided for in the school or a department/program budget. Contributions to the Annual Fund support the areas of greatest need at the school as identified by the Principal in consultation with the Campus Improvement Team as well as the Alumni Association’s Allocations Committee. Contributions to the Annual Fund also help the Association support alumni programing, specifically the Hall of Fame Awards and other alumni events designed to bring alumni closer to each other and the school. The Levels of Giving recognition categories are the same as those listed for the BEST of Burkburnett Endowed Scholarship Fund.